Gum Tubing: This is abrasion resistant and cost-effective. It acts as an excellent vacuum tubing since it has tear resistance and memory. This type of rubber tubing is temperature resistant and maintains a high coefficient of friction in various applications. Latex Tubing: Latex is transformed into sheet stock or dry stock. It is vulcanized and the compound is extruded or molded in order to get a finished product. This type of tubing has excellent flexible characteristics at low temperatures. Silicone Tubing: This is suitable for high temperature processes. This rubber has the the property of heat ozone, chemicals and ageing and widely used in industries like pharmaceuticals and health care. 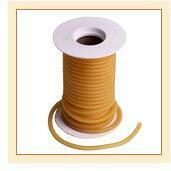 Nylon Tubing: It has a high elastic memory and can withstand long periods of time without fracture. It also has high-impact resistance. Hardness: This is the characteristic of the rubber to resist against permanent deformation. Specific Gravity: This is the ratio of the density of rubber to the density of water at a given temperature. Tensile Strength: This the maximum stress that the rubber can withstand without breaking. Elongation: It is the increase in the length of the rubber which is caused by longitudinal tension and this is expressed in terms of percentage. Brittle Temperature: This is the lowest temperature at which the rubber becomes brittle. Operating Temperature: It is the range of temperature in which the rubber tubing can be used safely and effectively. Diameter: This is the measured distance between the two ends through the center and expressed in inches or centimeters. Rubber tubing has several performance specifications and important dimensions. Rated pressure: The short-term burst pressure at 75° F.
Maximum vacuum: It is referenced below one standard atmosphere. Minimum bend radius: It is based on an acceptable cross-section deformation. Temperature range: The full-required range of ambient operating temperature. Conductive or semi-conductive tubing: This prevents the buildup of static electricity. Spark resistant tubing: This tubing bears electrical discharge. Explosion proof tubing: This type of rubber tubing can prevent explosions caused by gas, vapor, or dust. Sterilized tubing: This is treated with dry heat, gamma irradiation, or chemical disinfectants. Reinforced tubing: This tubing includes fibers or banding, multi-layered tubes containing concentric layers, and multi-element tubes built in a flat or ribbon configuration. Coiled or spiraled tubing: This type of tubing is also available. Corrugated rubber tubes: These rubber tubings provide increased flexibility and capacity for compression and elongation. It can withstand electrical discharge. It is available in multi-color.